ARE YOUR DENTURES LOOSE? ARE YOU EXPERIENCING EMBARRASSING MOMENTS BECAUSE OF YOUR DENTURES? Are you wishing you could smile without embarrassment? Would you like to feel confident about your smile but are concerned about your dentures–that they may slip or even fall out? Are you finding that you are not speaking as clearly as you’d like? Do you have health concerns because you aren’t able to eat and digest food properly? 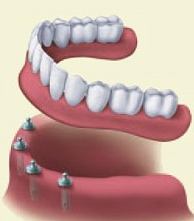 If so, Dr. Hecht at Staten Island Dental Care may have an amazing solution for you– mini implants. What are the advantages of Mini Implants? MESSY ADHESIVES ARE GONE FOR GOOD–For years, the only way to secure traditional dentures was with messy adhesives. And sometimes those adhesives don’t even work. Mini implants are a permanent, non-messy solution as they are placed into your gums and become “new” tooth roots and teeth. The dentures attach to the implants so the need for messy adhesives is over forever. THE PROCESS IS NOT PAINFUL–The mini implant treatment can be completely without pain or discomfort! This procedure was designed to be comfortable and simple, with little to no pain for patients. PREVENTS PAIN EXPERIENCED WITH TRADITIONAL DENTURES–Traditional dentures can rub and cause soreness to your gums and mouth. Mini implants are like having a “new” tooth root and tooth and when the dentures are attached to them, the dentures don’t move or rub. You will be amazed at how comfortable having dentures is now. YOUR SPEAKING, DIGESTION AND SELF IMAGE ARE ENHANCED–Imagine being able to speak without the worry of dentures clicking or being unable to pronounce your words properly! Imagine being able to eat foods you enjoy and being able to properly digest them. The health benefits are beneficial to say the least. Think of the confidence booster you can have by never having to worry about whether your dentures are secure or not. SMILE WITH CONFIDENCE–Go ahead and laugh and smile and get your photo taken. You can do all those things with confidence. Not worrying about your dentures slipping can make you want to smile the whole day long! PAYMENT PLAN THAT IS AFFORDABLE AND ECONOMICAL–Dr. Hecht cares for you and he and his caring, well-trained team are ready to give you back your smile without making it difficult financially. Ask Dr. Hecht about his payment plan options today. FDA-APPROVED STATE-OF-THE-ART SYSTEM–Dr. Hecht is confident of the mini implants procedure, knowing it has been tested safe by the FDA. THIS PROCEDURES IS ONE-STEP AND NON-SURGICAL–Though it sounds almost too good to be true, the mini implants procedure is completed in one visit. You walk out of our office with mini implants and dentures that will stay in place. It sounds like a miracle and maybe it is. But nevertheless, it’s true and we are pleased to offer this to you. Loose dentures can be a trial and an embarrassment. Call Dr. Hecht today and he and his caring team can restore your smile to health and beauty. Always a pleasure when meeting with Gari. Great conversation goes a long way! She makes you comfortable and relaxed. Gari has always provided me with excellent care and explanantion of my dental status. I am very happy with my care. Gari as always provides exceptional service and her professionalism goes without saying. She has always been someone that I would always go to because she makes you feel very comfortable in all situations. She is a true asset to the office. Great and professional service as always! I just want to say that I have not gotten a filling done in years and I must say that this has been the most pain free job I have ever experienced. Dr. Hecht is such a great dentist and I highly recommend him to anyone who is afraid of the dentist! Also, visit three of our microsites! Like Our Practice? Review Us! Staten Island Dental Care - Staten Island dentist Dr. Fred Hecht offers cosmetic dentistry, dental implants, sedation dentistry, and restorative and general dentistry in Staten Island, NY.